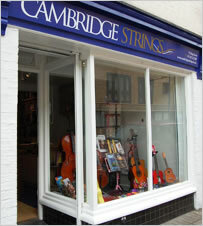 Cambridge Strings is a specialist stringed instrument store with over 40 years’ experience in music retail, offering a high-quality service and competitive pricing to all musicians. printed music – extensive stocks, covering all styles, popular and classical, with a special focus on music for stringed instruments. We hope this gives you a flavour of our services and look forward to welcoming you to our shop and site. Why not click here to join our mailing list so we can keep you informed of up-coming special offers and events.